"Kono teiri ga utsukushii" (These are beautiful theorems) is now published (in Japanese) by Sugakushobo. 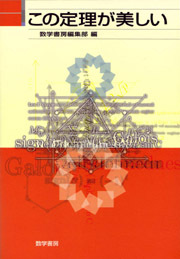 Many introductory articles on beautiful theorems are included in this book. I am one of the 20 authors. I wrote an introductory article on "Hasse's theorem" on the number of rational points on elliptic curves over finite fields. 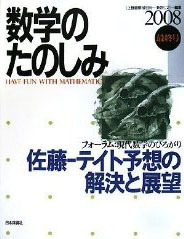 Sugaku-no-Tanoshimi (Have Fun with Mathematics) 2008 is now published (in Japanese). Many articles concerning the Sato-Tate conjecture are included in this volume. I wrote articles on elliptic curves, outline of the proof of the Sato-Tate conjecture, and Galois deformation theory.